Bar codes are a machine-readable representation of data. They have expanded in complexity from the original data representation in varying widths and spacing of vertical lines to those used today which can make use of squares, dots, and other shapes and patterns. Originally, bar codes were only used in businesses such as supermarkets to track inventory. Today, they have been incorporated into all phases of business, including the identification of everything from company equipment to personnel identification. Tracking bar codes can be accomplished through reading by an optical scan or special image scan. To track bar codes, decoding software such as the Barcode Scanner application from Brothersoft.com has to be used. This article will explain how to trace bar codes. Download and install the Barcode Scanner, a bar code tracking program available free from Brothersoft. Take a digital picture or scan the bar code image you want to track. 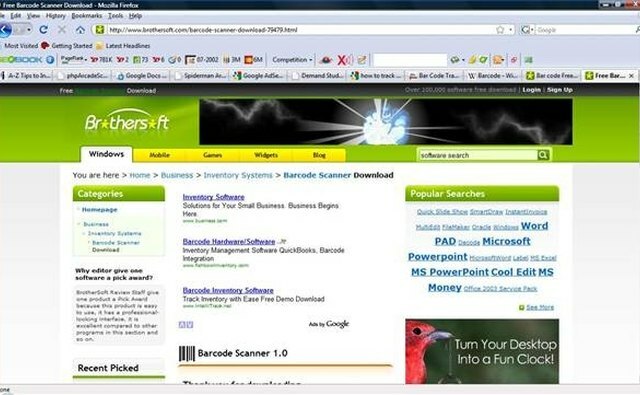 Select "Browse" on the Barcode Scanner software. Select the bar code image taken in Step 1. Choose "Extract" to retrieve the bar code information. Repeat Step 2 through Step 4 for all bar codes that require tracking and identification.